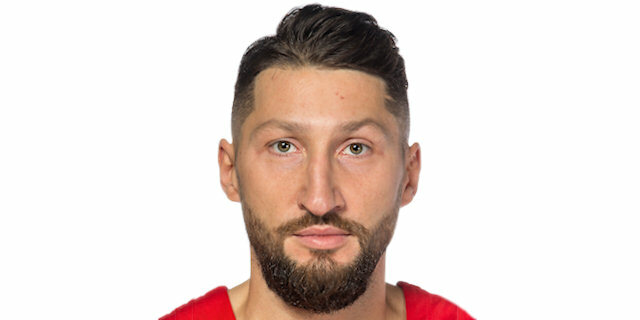 In a thriller that went down to the final minute, CSKA Moscow registered its sixth win in Group D by downing Dinamo Banco di Sardegna Sassari 93-87 in the Russian capital on Friday. CSKA, which had already qualified to the Top 16, improved to 6-1 in Group D. Sassari dropped to 0-7 and was mathematically eliminated from Top 16 contention. Milos Teodosic led the winners with 21 points and Nando De Colo scored 17 on 12-of-12 free throw shooting. 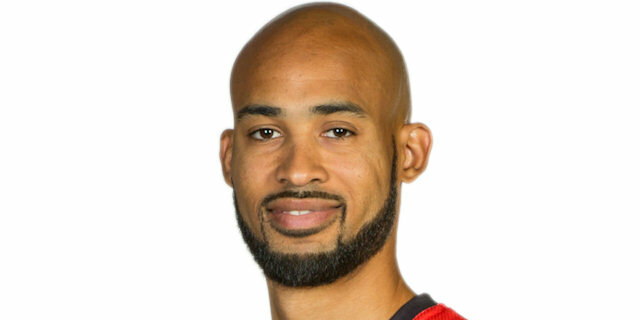 Cory Higgins added 11 and Nikita Kutbanov 10 for CSKA. David Logan led Sassari with 21 points, Christian Eyenga added 19, Marquez Haynes 14 and Jarvis Varnado 10 for the visitors, who bounced back from a slow start to take a 25-26 lead after 10 minutes. CSKA improved its defense after that and found a go-to guy in Teodosic, whose buzzer-beating three-pointer gave the hosts a 50-45 lead at halftime. Teodosic kept pacing CSKA after the break. A three-pointer by Vitaly Fridzon made it 70-58 through three quarters. Sassari started to run its offense through Logan, who had 11 quick points and a huge tomahawk dunk by Eyenga tied it at 82-82. A three-pointer by Haynes tied the game again, 86-86, already in the final minute, but Teodosic answered from downtown and De Colo hit 4 free throws to win it for CSKA down the stretch. 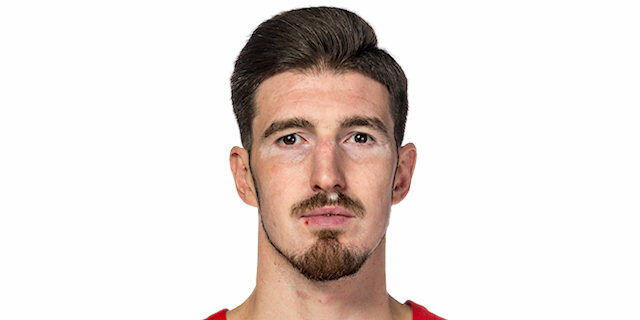 De Colo got CSKA going with a close basket and Andrey Vorontsevich added free throws for a 4-0 lead. 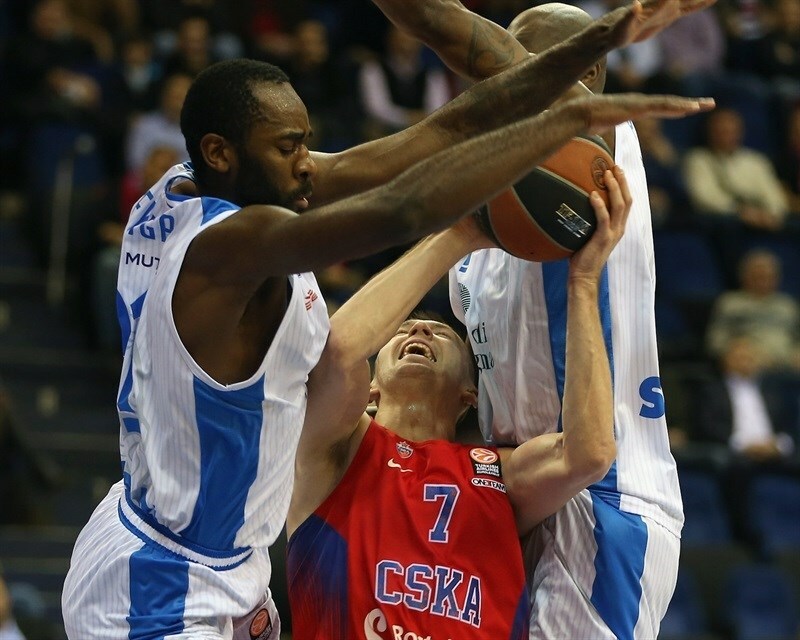 Haynes struck from downtown, but Vorontsevich split foul shots and De Colo soon gave CSKA a 7-3 edge. After Brian Sacchetti buried a triple from the right wing, Fridzon hit free throws. Petway followed a put-back dunk with an off-balance jumper to give the visitors their first lead, 9-10. Fridzon made more foul shots, but Logan buried a rainbow jumper. A corner three by Kurbanov put CSKA back ahead, 14-12. 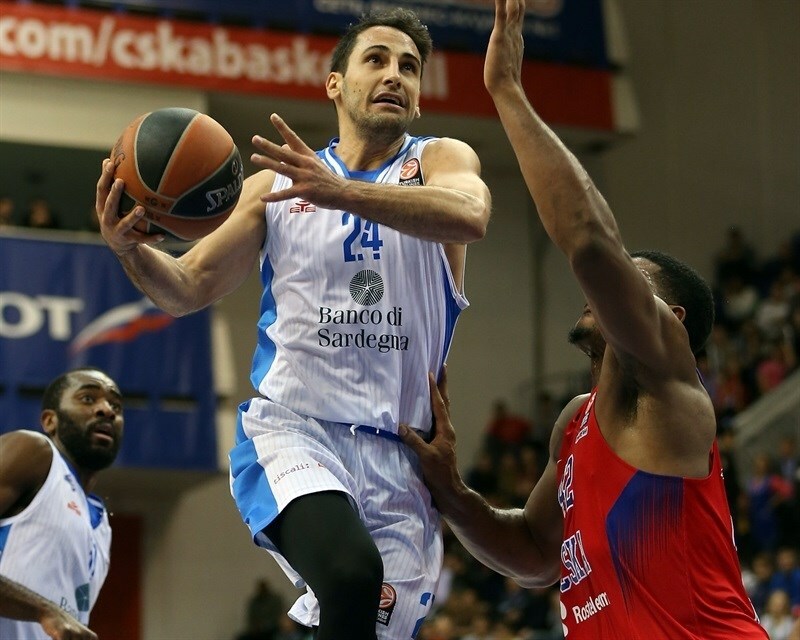 Sacchetti shined with a put-back basket and a backdoor layup by Rok Stipcevic restored a Sassari edge. Pavel Korobkov hit a jump hook and Petway scored in transition. 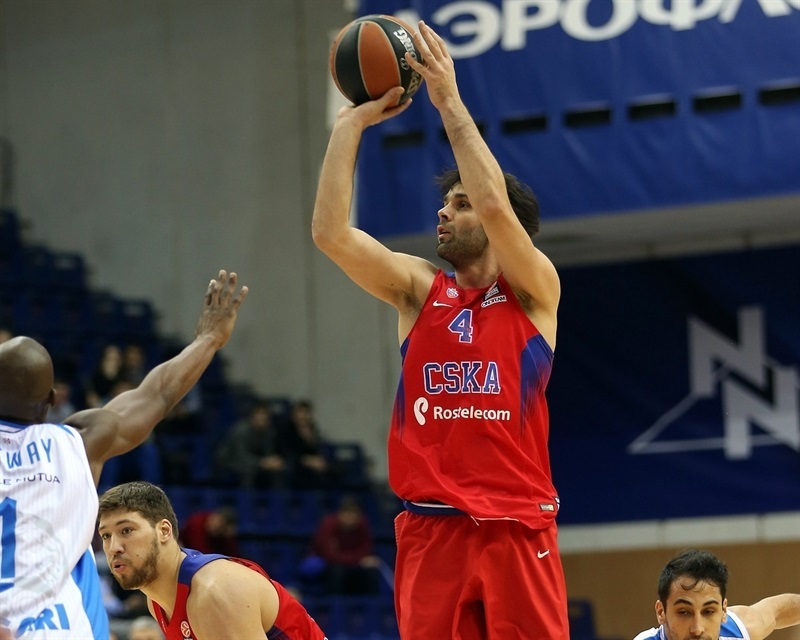 A three-pointer by Milos Teodosic gave CSKA a 19-18 edge. Korobkov and Eyenga hit free throws and a layup by Gia DeVecchi tied it at 21-21. Higgins split foul shots and a three-pointer by Eyenga gave Sassari the lead. Eyenga scored in penetration, but a three-pointer by Teodosic kept CSKA within 25-26 at the end of a very exciting quarter. Higgins shined with a driving layup early in the quarter and a fast break basket by Kurbanov forced Sassari to call timeout at 29-26. Slava Kravtsov split free throws and an off-balance jumper by Logan kept Sassari within 30-28. Logan buried one from downtown, but Demetris Nichols took over with a high-flying put-back slam. An alley-oop dunk by Petway gave the visitors a 32-33 edge. Nichols buried a three-pointer and Eyenga nailed a mid-range jumper. Teodosic did better with a bomb from downtown for a 38-35 CSKA lead. De Colo drew a couple of fouls and hit 4 free throws to boost the hosts' lead to 7. After Matteo Formenti buried a corner triple, Kyle Hines took over with a dunk and Higgins pushed CSKA ahead 45-38. Eyenga beat the shot clock with a three-pointer, erased Hines's driving layup with a big basket in penetration and soon added a put-back slam to bring Sassari within 2. A big triple by Teodosic fixed the halftime score at 50-45. Teodosic fired in a mid-range jumper soon after the break, as CSKA now tried twin point guards with him and Aaron Jackson together on court. Jarvis Vanardo dunked, but so did Vorontsevich for a 54-47 CSKA cushion. Haynes nailed a three-pointer, but Teodosic buried another five-meter jumper off the dribble and Kurbanov struck from downtown to boost the hosts' margin to 9. Haynes sank another one from beyond the arc only to see Teodosic score in penetration. A free throw by Hines kept the hots in control. Eyenga shined with a big basket in the low post and after Hines split free throws, a three-pointer by Logan gave Sassari hope at 63-58. Higgins hit foul shots, which Korobkov followed with a tip-in to boost CSKA's lead to 9. Sassari struggled to score for the first time in the game and a three-pointer by Fridzon made it a double-digit game, 70-58, at the end of the quarter. Stipcevic tried to ignite a Sassari comeback with a quick basket early in the quarter. Nichols collected a steal and scored at the other end, but Varnado erased that with a tip-in. 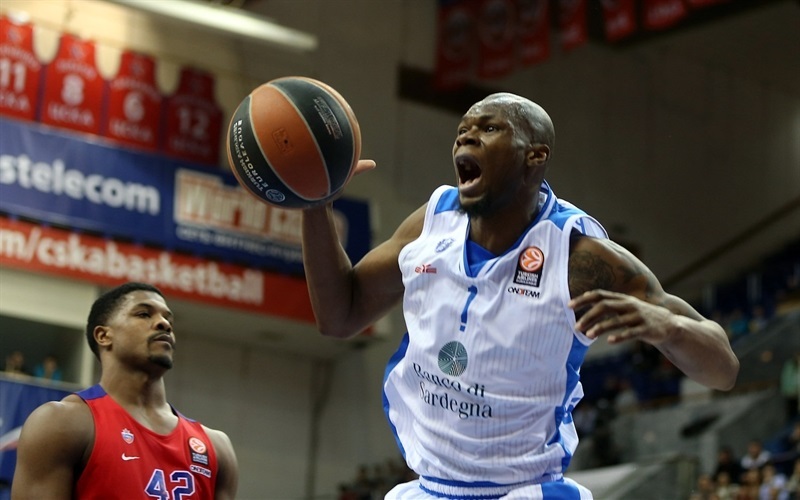 Haynes scored in penetration to bring Sassari within 72-64. Higgins followed a three-pointer with a driving basket, but Logan struck twice from downtown, one from each wing, to get his team even closer. Nichols and Varnado traded baskets before De Colo struck from downtown to keep CSKA way in control. Logan hit another big triple and Varnado added a layup-plus-foul that made it a 5-point game with four minutes left. Logan hit a three-pointer in transition and an outstanding dunk by Eyenga tied it at 82-82. 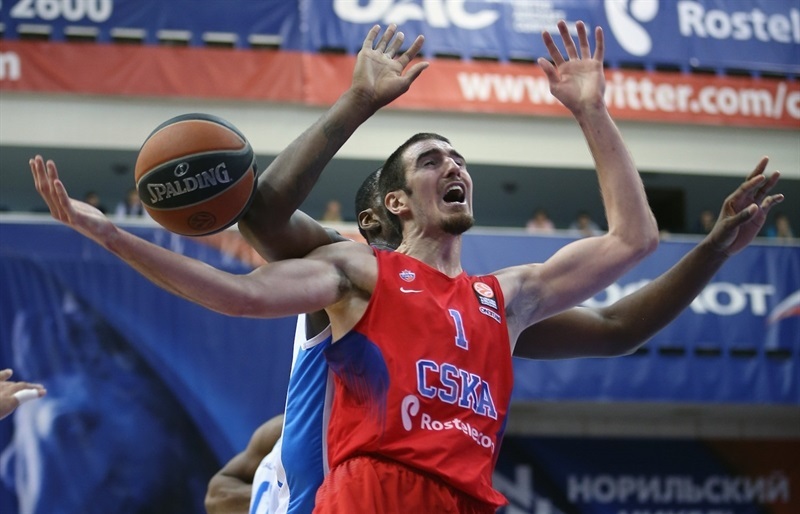 De Colo hit free throws and a dunk by Kurbanov gave CSKA some fresh air, 86-82, with two minutes left. Sacchetti split free throws and a triple by Haynes tied it again, 86-86, with 59 seconds left. After Teodosic hit a critical three-pointer, Varnado split free throws and De Colo hit 4 attempts from the line for an 93-87 CSKA lead with 7 seconds left, which was enough to seal the outcome. "Nothing is easy in our life. You have to work hard to win. When we prepared for the game, we asked the team not to let the opponents receive anything easy. Still, we had a sloppy start, first of all defensively, and let the opponents do a lot of easy things. 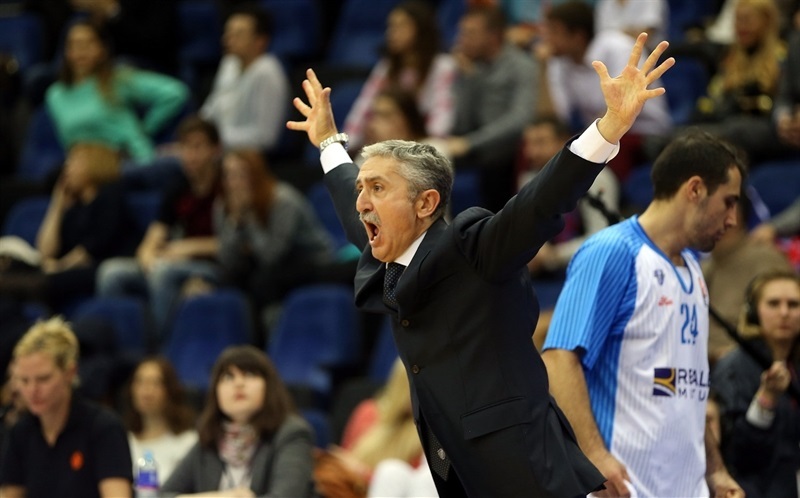 As I warned before the game, Dinamo played with different level of intensity. They had 7 team rebounds taking loose balls, they had 18 offensive rebounds overall, the set the tempo on defense, pressured us. In the third quarter, we took over and went up by 12, but Logan and Haynes played great and allowed their team to tie it in the end. We will study why we let it happen. But in the clutch we created good spacing, we made right decisions and got key plays from Teodosic, De Colo and Kurbanov. Hines made 2 huge blocks. The game will be a good lesson for us." "We played good game, but not good enough to win. You need to play a little better if you want to win in Moscow. CSKA knows the ways to win and we have to improve many small things, to change our mentality to compete in Euroleague. We had a bad third quarter but did not give up. We have the same number of rebounds, just 10 turnovers, so we were able to fight and the score was tied with 15 seconds to go. But we allowed the rebound on our glass and Teodosic made an important three-pointer – everyone knows that he is capable of hitting big shots." "It was a tough game for us. We didn't cope with Dinamo playing one-on-one and we missed some rebounds. Sassari is a fast, athletic and good-shooting team. Today, we just didn't keep up with our opponent on defense. We are definitely not relaxed. Every game is like a final for us." "I think we didn't really respect our opponent. They have a really good team and they came in with nothing to lose and played good basketball. We need to play better defense. I think we did it in the third quarter. But after we let them find their rhythm again and this is why the game was very difficult at the end." "It was a tough game for us. 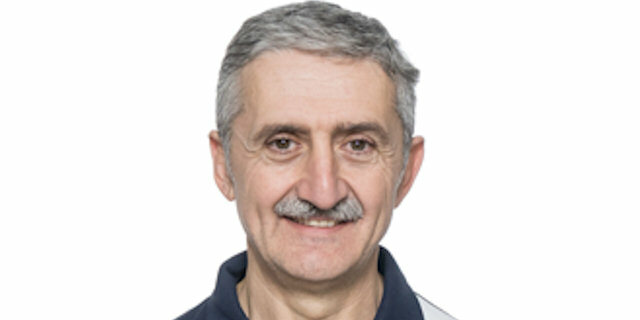 We have a new coach. We played really well, did what we wanted to do in the game. Maybe we were scared a little bit and did not play all the way through when we needed to move forward. We will learn from our mistakes. CSKA got some important offensive rebounds and it was one of the crucial moments in the fourth quarter – and they just scored. We will keep playing hard."